Abira arrived with her sister Katara on August 7th 2013. A facility in mid central Florida was closing out their animal exhibit due to the owner’s terminal illness. That is when Gatorland stepped up to the plate to help all the animals out. They quarantined and held all the animals and those that they did not have room for, they began to research good homes for. When we got the call asking us to take Abira and Katara we were of course honored. 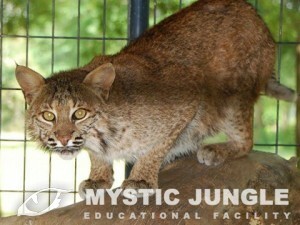 Sadly, we lost Katara shortly after arrival due to liver disease. We of course monitored Abira making sure she adjusted to solitary life without her sister. She has of course stayed the course and is thriving here at the Jungle.